CottonAge is a brand that makes a variety of clothing such as bath and spa attire, and everyday shirts and sweatshirts. Specifically, I love their hoodie designs. They are unique and expressive which is a big deal to me when it comes to fashion. I received the Lifeguard Hoodie from CottonAge. It is so soft inside! It’s perfect for nights I’m snuggled up on the couch and want to keep warm. It fits great and is very comfortable. It washes well and the design on it hasn’t been affected from the wash. 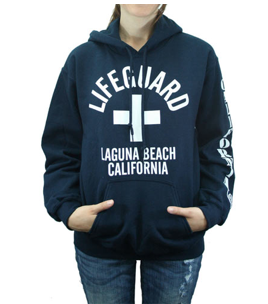 I always wanted a lifeguard symbol hoodie for some reason so I was thrilled to get it. The navy blue color goes with pretty much anything whether I’m wearing jeans or sweatpants. One winner will receive a tshirt of their choice from the Graphic Tshirts section! I am loving the 714 graphic hoodie. "Swag Graphic Design Tee" is my fave!